Who says modern art can't be beautiful? Certainly not Jim Hodges, whose work is collected in a poetic show opening this weekend at the Walker. When Walker Art Center director Olga Viso first encountered the art of Jim Hodges in a Los Angeles gallery nearly 20 years ago, she was transported into a shimmering mirage of memories. A fluttering cascade of silk scarves opened for her a bower of sunlight, warmth and elusive scents. Echoing that moment, Viso has gathered a lyrical retrospective of Hodges' work, "Give More Than You Take," which opens with a preview party Friday night. Jim Hodges’ delicate 1997 montage of scarves and artificial flowers defies the traditional notion of sculpture as a macho statement in steel or stone. A trove of sensual stimulation, the 80-piece show begins with a ribbon of artificial flowers tumbling from the ceiling and a wall strewn with flower petals like a bride's path. There are intimate drawings of the full moon, chain-link spider webs, glass bells, shattered mirrors, mosaics of black glass and mirrored tesserae. There is a dark room where perfumes mix — male and female — and a gold-leafed forest enclosure. There are camouflage patterns everywhere, wanted posters without faces, a glass-crystal skull, and musical scores sliced into poetry. 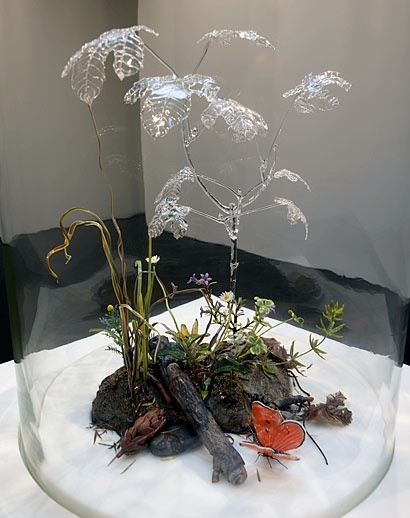 A glass artist from Portland created at Hodges' request a 3-D interpretation of Albrecht Dürer's famous watercolor "The Great Piece of Turf," complete with fool-the-eye leaves, blossoms and beetles. And Hodges and his assistants stitched up a vast tapestry made of worn denim that explodes across a two-story wall as if it were a neo-baroque vision of the heavens. "Give/Take" is, in short, an unusually enticing antidote to the frigid days of a particularly irksome Minnesota winter. Spanning a quarter-century, the show is typical of an artist who doesn't fit any easy categories. At a time when a lot of contemporary art isn't very pretty, his art is beautiful. And it concerns such eternal topics as life and death, nature and artifice, daylight and darkness, earth and sky, now and then, and the poetic interplay of such opposites. Though known internationally, Hodges, 56, hasn't been shown much in the Twin Cities, aside from four boulders faced with colored steel that the Walker installed in 2012 on the hill overlooking the Minneapolis Sculpture Garden. Born in Spokane, Wash., he earned an MFA from Pratt Institute in Brooklyn in 1986 and has lived in New York City since then. The show, which runs through May 11 and was organized in collaboration with the Dallas Museum of Art, is the second exhibition Viso has personally curated since she became the Walker's director in January 2008. It follows her 2010 retrospective of Argentine sculptor Guillermo Kuitca, whose work was also allusively poetic. Q: Why have you done shows of these two artists? A: I felt it was time to look retrospectively at their careers. With Guillermo, it was about introducing his work to a broader American audience. And I think Jim is one of the most important artists of our generation. I've followed his work from the very beginning of his career, included it in a 1999 show, "Regarding Beauty," at the Hirshhorn [Museum in Washington, D.C., where she was deputy director], and then commissioned a major piece of his outdoor sculpture here at the Walker. So I feel he needed a comprehensive survey. Q: How is the show arranged? A: You'll see a choreographic interplay of works across time and in different materials. One room might be about saturation of color, another about compression in space, or dispersal, or dissolving. You might encounter pieces that are 15 or 20 years apart but create a mood or a heightened experience. Hodges’ love of nature was nurtured in the Pacific Northwest, where he grew up before settling in New York. Q: That sounds rather theatrical. Is it? A: There are several room-sized installations that really are stage sets for human experience. There is a dark room-within-a-room, and mirror pieces that reflect and refract light. So there is a theatricality without it being dramatic. Q: How does he fit into the pantheon of contemporary artists? A: He's of the same generation as Robert Gober, Mike Kelley, Kiki Smith, Katharina Fritsch, Felix Gonzalez-Torres and other artists from the '90s who work with very quotidian materials and mine them for what they reveal about our humanity. These artists really changed the landscape in the mid-1990s. While Gober is looking at the dirty underbelly of American culture and Kiki Smith works from the point of view of a woman, Jim is turning to where the private and public intersect. He is not afraid of using notions like romance, beauty, even kitsch, which he really brings to the surface and pushes to the edge of discomfort. That's what makes his work so raw and important. He pushes sentiment and the sublime like no other artist. Q: What's the significance of his materials? A: When Jim started using silk flowers and scarves in the early 1990s, that was a very subversive act. He was definitely trying to feminize and to queer his practice, and was coming out as a gay man working with material that was definitely not associated with masculine sculpture. A lot of art coming out of the AIDS culture was angry, and his was much more responsive. His work is not always about beauty. There is death there, and pain. His are poetic meditations than can be read at many levels. Jim Hodges' “Movements (Stage II)”, a mosaic made from bits of mirror. Q: What is the role of beauty in his work? A: In the 1990s, beauty was so contested. Art was all about content and political issues. It's not that Jim's work doesn't deal with those things; it does. But there's a rage and delicacy that are brought into a very interesting creative friction in his work. He wasn't afraid to introduce beauty and the sublime. It is a part of life, of culture and of experience. He grew up in Washington state and nature has always been a very potent element of his work and the imaginative landscapes he creates. He finds the simple beauty in mundane objects and materials. Sometimes he celebrates it, sometime subverts it, sometimes unravels it and surprises you. Q: In the catalog for this show, you wrote an essay titled "The Eros of the Everyday." What does that mean? A: Jim uses these common everyday materials we might overlook or dismiss but they have a kind of potency. You can't walk out of that show and not be conscious of your space, of things on the wall and floor that you might not have been conscious of before. He has the ability to create objects that reveal something about how it is to live in this world — to live and to love and to die. He finds the epic in the mundane and the mundane in the epic.